Tables feature transitional styling achieved by the soft curves of the legs complimented by clean lines. All solid brown maple construction, full extension glide drawers are dovetailed for long-lasting heirloom quality. Each drawer is accented with designer hardware pulls. Tables are available in any specie of wood, stain, hardware, and can be ordered in your custom sizes as well. Made in USA! End Table: H-24 W-22 D-24. Coffee Table: H-18 W-42 D-22. 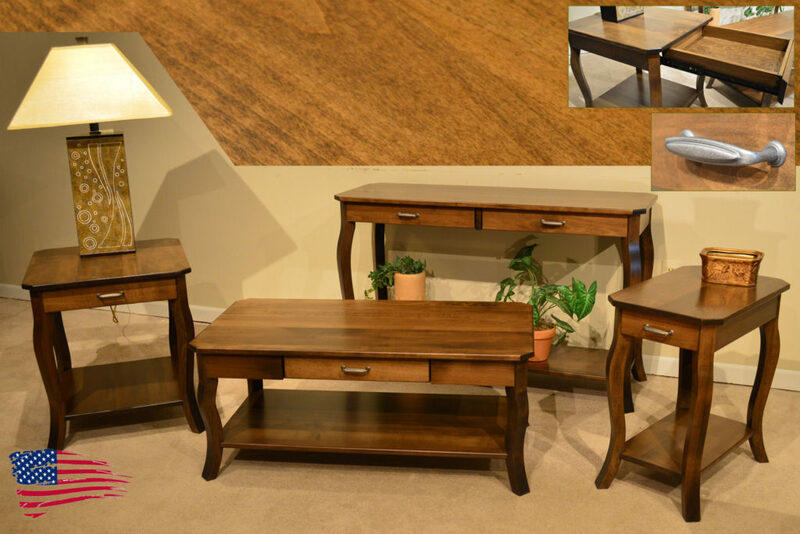 Amish Cappuccino Tables features catalyzed finish for an exceptional lifetime durability, plethora of style, finish colors, two tone options available, custom sizes, custom shapes, and wood specie options in solid (oak, maple, cherry, rustic cherry, tiger oak (quarter sawn white oak), rustic tiger oak, tiger maple, walnut, grey elm, hickory, hard maple).